You already know we are your local Pest Control Experts! The beauty of the Muskoka, its natural landscapes and waterways make this area one of the most desired destinations in the world. In addition to all of the year round and seasonal visitors, Muskoka is home to many types of wildlife. Raccoons, Squirrels, Skunks, Fishers, Porcupine, Otters, Beavers, Bats and more call Muskoka home. An Extensive amount of experience and knowledge in animal biology and behaviour is required to ensure successful and safe removal of Wildlife. 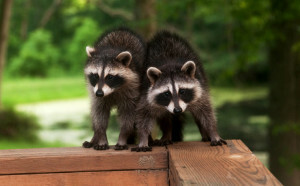 Muskoka Wildlife Control by Muskoka Pest Control is the solution to your Wildlife and Animal control issues. Let us perform a comprehensive inspection of your roof and attic to identify the species, entry hole, and the best plan of action to solve your problem. Our professional wildlife removal is done with the assurance that no animal will be harmed in the process. After removal, the next step is to make sure they cannot get back in from other vulnerable, weak spots by repairing and protecting them with screening with our expert exclusion process. Did you know we are also your local Wildlife Control Experts? Visit our Muskoka Wildlife Control Website For More Details!